Colorado Jobs with Justice, a front group for Jefferson County Education Association, fell flat on its face last night and took one step closer to being the Napoleon in this Waterloo scenario. 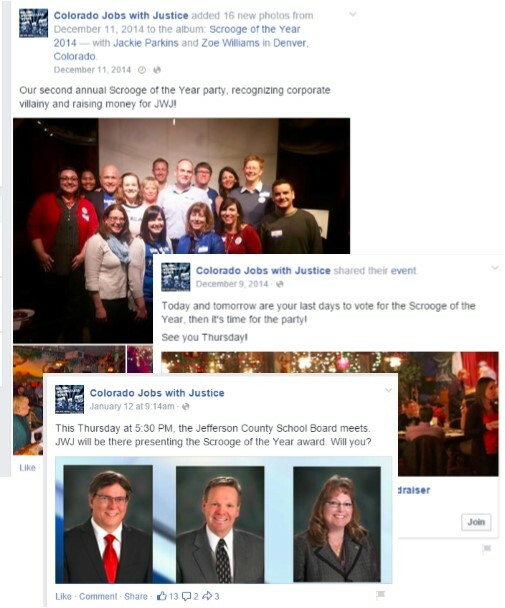 Jobs with Justice promised all over Facebook that it would award its Scrooge Award to the Jefferson County School Board pro-reform majority. For what? We may never know…because it was never awarded. Let’s go through the timeline. In December, Jobs with Justice hosted a voting party at which attendees could pay to cast a ballot for the person or entity who had been bad to workers. Interestingly, the board majority, which received the most votes, also last year gave teachers the first raises they received in years as well as paid for their PERA. What a$$holes. But, we digress. Jobs with Justice posted all sorts of pictures from the event, which Colorado Education Association President Kerrie Dallman attended. This week, Colorado Jobs with Justice invited everyone to the Jeffco School Board meeting last night, promising to award the honor. Even at the meeting, a speaker promised that everyone would see what was about to go down – the Scrooge Award. The only problem is that once it was discovered that Brown believed she had signed up and was not on the list, a representative from the district sought Brown out and offered to let her speak. Brown declined the offer, went home, and told the district representative that she would just do it next time. In the second public comment session, Board President Ken Witt even called for Brown to come speak. To be clear – he was calling for Brown so that she could come to the podium and say horrible things about him. Twice he called for her. Given this knowledge, it’s pretty clear that the JCEA is purposely deceiving its members and is lying either to cover up this massively embarrassing f&ck up or to try to make the board look bad. Either way, in the macro, this was a huge black eye on a union that’s already struggling to maintain relevance. And, make no mistake about the union’s involvement here. Despite the award coming from Jobs with Justice, Scott Kwasny, whose LinkedIn profile shows him still working as Executive Director at Colorado Jobs with Justice, also is listed as the JCEA’s communications director. Not to mention that Jobs with Justice admitted that JCEA “really hustled to get votes” for the Jeffco School Board. Last month, JCEA President John Ford promised in a video that January would be when the fight would start. Unfortunately for Ford, it looks like this first fight was a TKO. We suspect the next punch will come not from pro-reformers, but from the National Education Association (aka, the big bosses). Of course, if we were their parents, we simply would ground them and take away their allowance for being so embarrassingly undisciplined.